Tying Tenkara – Heresy in the making? Skip March 22, 2019 Fly Fishing, Fly Tying, RECENT, Slide, Tenkara, Tips & Tactics, Videos No Comments on Tying Tenkara – Heresy in the making? Jason Klass of TenkaraTalk.com in Rocky Mountain National Park. This video is not about our tying the subject fly. It’s about the value of a well tied Tenkara style dry fly, and a fly fisher with Tenkara creds, a fly tyer with creds who happens to makes a living at it by guiding. His name is Jason Klass. Our purpose is to show how a typical Tenkara style dry fly is put together properly and how it is fished uncast (speaking of conventionally cast) using the ancient Tenkara style of presenting a fly. A Tenkara fly gets placed in the water with the aid of a simple, but atypical cast that is limited in distance. The limitation is the stance of the angler, maximum arm reach, and lengths limits of both rod and reeless line. The productivity of floating a fly tied upside down and presented perfectly straight can be lethal. Too, seeing the eat is also one of the most witnessing thrills of catching trout and other fish like panfish and basses, but not necessarily limited to those animals. The value of the limited float (distance) of a Tenkara fly is that it swims perfectly positioned – straight up and down, and properly fished it is undragged by the fly fisher and delivered only by current. The experience of two, this angler and my oft-times fishing bud Angie Roth – one of the best dry fly anglers I know, vouch that compared to conventional fly rod and reel. 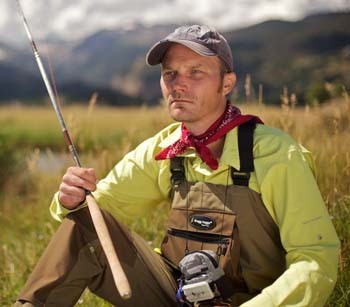 using popular dry flies, and schooled presentations, the Tenkara method outscores… measurably. Featured Image photo by Daniel W. Galhardo. Subject: Dr. Hisao Ishigaki (approved to use image) Tenkara fly fishing. A commons image.